As you probably know, burgers are one of my favorite things to make, but more importantly, they are one of my favorite things to eat. I like to think that I’ve developed some pretty good burger making skills over the years through a lot of trial and error. If anyone wants to be a taste tester, let me know. A good cheeseburger is super simple, yet there are a lot of variables that can have a huge impact on the final product. The type of meat you use, the way you form the patties, what type of pan you use, the bun, the cheese, and the toppings are all things that will effect the final burger. You can check out my burger tips but I will reiterate some of them here as well. I always use freshly ground meat when making burgers. You don’t have to but if it’s available to you, I’d definitely recommend it. I also use chuck with at least an 80/20 lean to fat ratio. I’ve played around with other cuts and combinations of cuts and I personally enjoy pure chuck the best. Something that’s important to keep in mind when forming patties is to be as gentle with the meat as you can. I like to gently form the meat into balls and then compress it using my hands. You don’t want to start messing around with it too much, it can result in a dry burger. Also never add anything to the meat. You don’t need an egg, you don’t need any spices, and you definitely don’t need any bread crumbs. We are making burgers, not meatloaf. 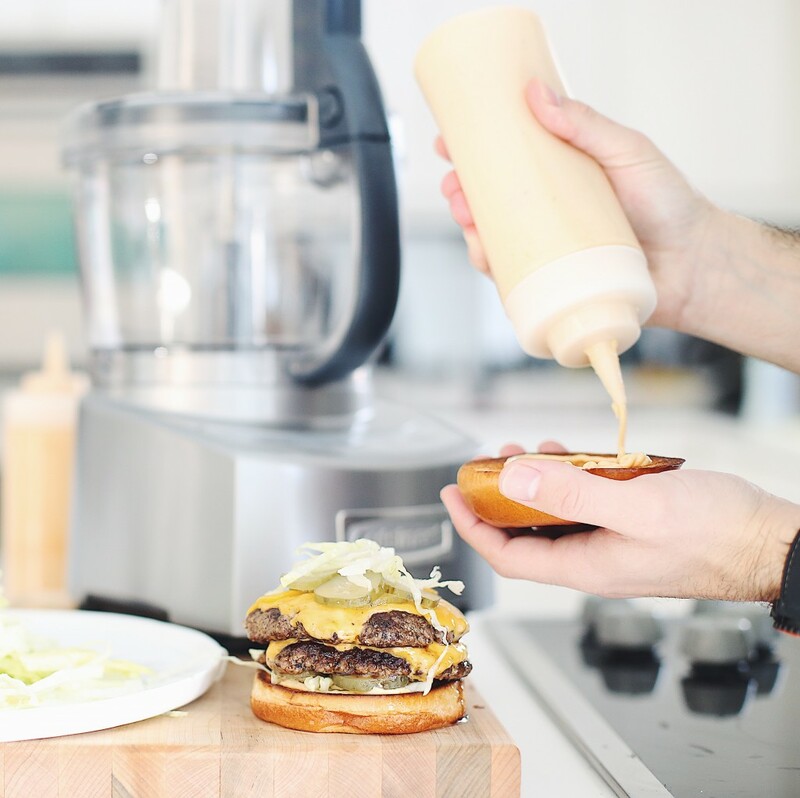 One of the often overlooked components of a burger is the sauce. I often see people just putting ketchup and mustard on their burgers, and while there is nothing wrong with that, I prefer to use a “special sauce” or a “secret sauce”. It’s that flavor that leaves you wanting more and what makes takeout burgers so good. If you want to achieve that takeout feel at home, I’d say special sauce is a key component. I’m going to share the recipe for the special sauce that I basically use on all of my burgers. It’s something that I always have at least a bottle of sitting in the fridge. 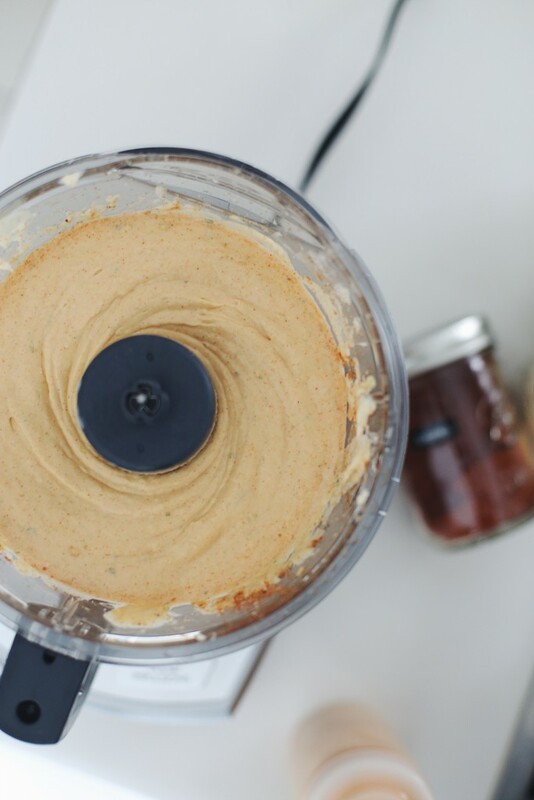 You don’t need any special equipment to make the sauce, but I like to run it in a food processor so it can smoothly come out of a squeeze bottle. 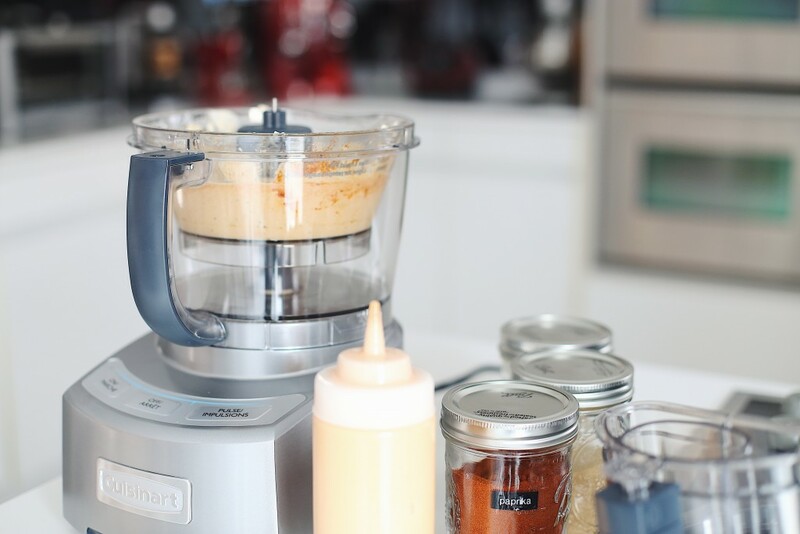 For this recipe, HomeSense has provided me with a Cuisinart food processor to help spread the word about the Privé event they have going on from March 23-29. The event focuses on perfectly priced brand name small appliances and is available in select stores. More information on HomeSense Privé can be found here. If you are interested in the Privé, keep in mind that there is limited quantity and the best stock will be available on the 23rd. If you don’t care about being able to use a squeeze bottle for the sauce, you can just mix all the ingredients together in a small bowl. I’m telling you though, once you try this sauce, you are going to want to keep it stocked at all times. The recipe makes just over 1 cup so if you want to make more or less of it, just double or half the recipe. The sauce also will keep for a long time if you are using relatively new ingredients. There is nothing in it that really goes bad, just be sure to note the expiry date of the ingredients if you plan to store it. 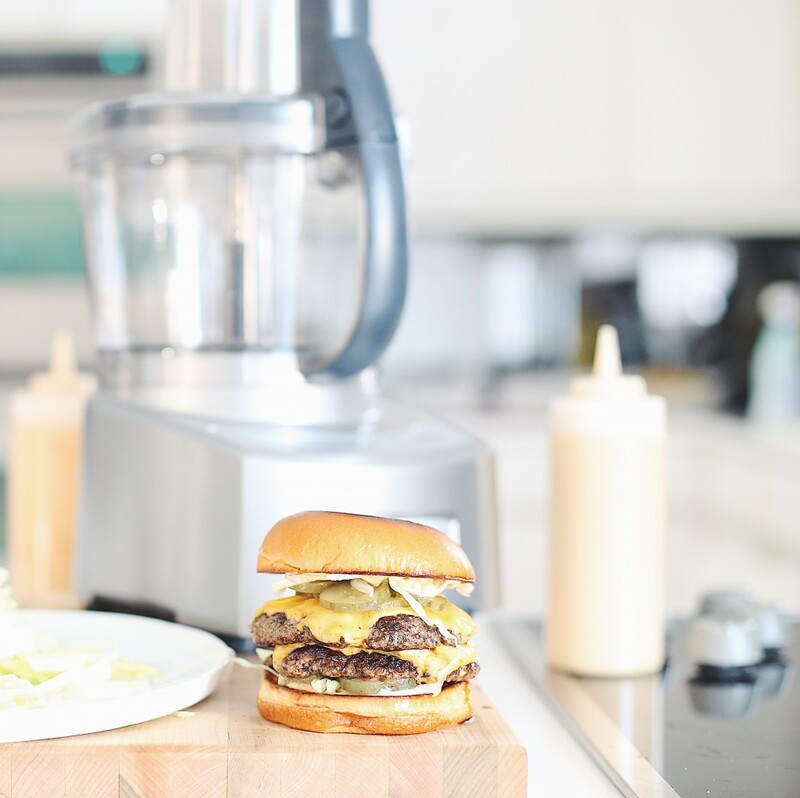 Whether you are new to making burgers at home, or have been struggling with achieving results you are happy with, if you follow my burger recipe, I can almost guarantee that you will be making drool-worthy cheeseburgers in no time! To make the special sauce, combine all ingredients in the bowl of a food processor and pulse until smooth. Alternatively, mix all the ingredients together in bowl. Chill in the fridge until ready to serve. To make the burgers, start by pre-heating a large cast iron skillet over high heat. While the pan is heating, divide the meat into 8 3.5 oz portions. There will be leftover so you can make an additional patty or freeze for making sauces or chilis. Gently shape the portions into balls and then flatten to about 1/4″ thick patties. Season one side of the patties generously with slat and pepper. Meanwhile, set another pan over medium heat and melt in enough butter to very lightly coat the pan. Toast all the buns cut side down until golden brown and then flip them over to toast the not cut ends. Toasting both sides helps gives the buns a bit more stability. Remove buns and place them on a workstation or plates where you will build the burgers. Melt a good amount of butter into your pre-heated cast iron skillet. You want to make sure it’s really hot. The goal is to get a good crust on the outside but leave the inside juicy. It’s going to be smokey so make sure your fan is on and fire alarms are at a safe distance. Place the burgers in the pan seasoned side down and then season the other side with salt and pepper. Sear for 1.5 minutes and then flip. Place the cheese on after the flip and sear for an additional minute. Remove burgers and place on tray. 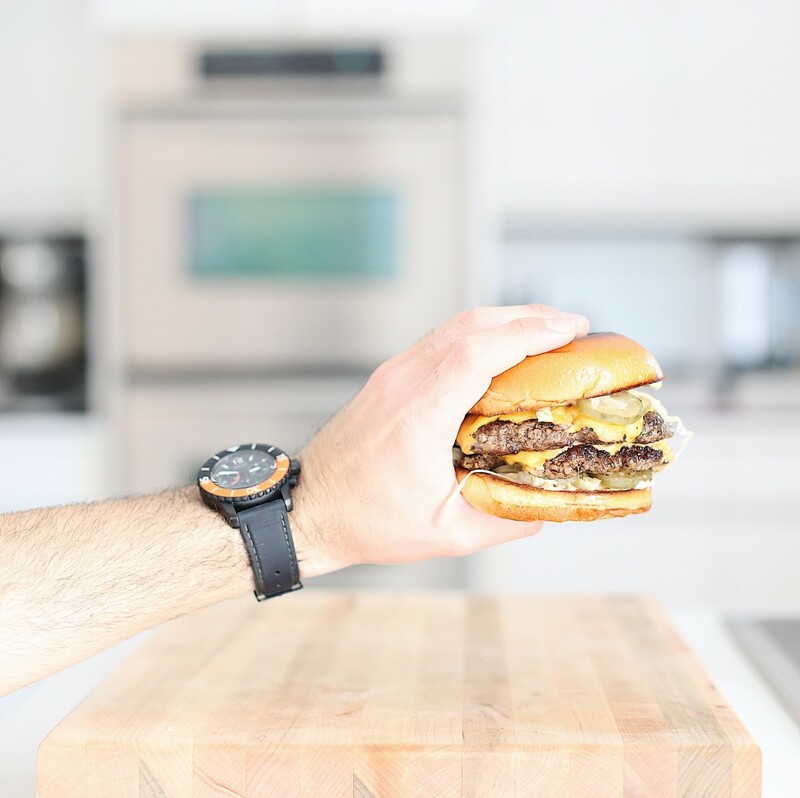 To build the burgers, squeeze or spread a good amount of sauce on both the top and bottom bun and place 2 patties on each bun. If desired, add sliced pickles, shredded lettuce, onions, and tomatoes.